Jack grew up in Tucson and attended Tucson High School where he lettered in golf two years and was on the team that won the 1950 state championship. He also was a member of the “T” Club. He earned a B.S./BPA degree from the University of Arizona, lettering in golf for three years. The golf team finished fourth nationally in 1953 and won the Border Conference championship in 1954. After taking graduate work at the UA, Jack joined the Professional Golfer’s Association in 1958 and was a Tour player for two years. It was Jack’s love of teaching the game that led him to becoming a teaching pro at courses like Randolph in Tucson, Oak Park Country Club in Illinois, Skokie Country Club in Glencoe, Ill., Westmoreland Country Club in Wilmette, Ill., and Highland Park Country Club in Illinois. 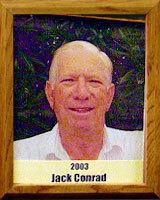 Jack was the head pro at Maple Bluff Country Club in Madison, Wis., for 10 years. The love of the desert eventually brought Jack and his wife Elizabeth back to Tucson where he served on many boards, including the Parks Commission for Pima County, the Pima County Sports Authority and the Southern Arizona Sports Development Corporation which was responsible for the development of Tucson Electric Park. In 1982 Jack opened his own private golf range, Jack Conrad’s Golf Practice Range, where thousands of Tucsonans have learned to perfect their game.